Social preventive fan coaching is a sustainable method of working directly with fans. This approach meets young people in their living environment and encourages self-esteem and self-assurance and their role in their clubs and the society at large. These social investments in young people are the very basis for preventing violent behaviours and racist and xenophobic orientations. Social preventive measures engage football fans in social educative activities and have a long-term perspective. This module is taking the approach of social preventive fan coaching as a method for grass-root oriented supporter projects across Europe. Developing a criteria catalogue for establishing social preventive fan coaching across Europe. 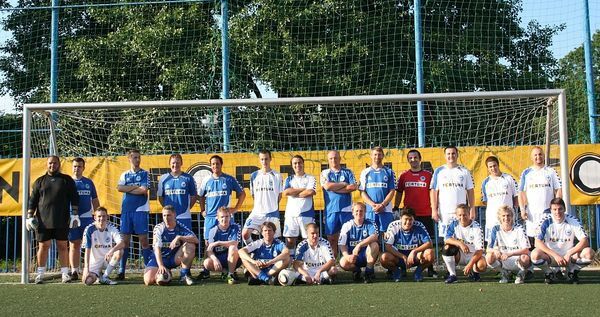 Slovan Liberec hosted the first network meeting of fan projects at European level from 9 to 11 July 2012. Next to representatives from German, Polish, Czech and Austrian fan projects, experts from KOS Fanprojekte (coordinating office of German fan projects), Kibice Razem Poland (Supporters United fan projects), FSE (Football Supporters Europe) and the Czech FA attended the meeting. The aims of the meeting were implemented in an excellent way. The participating fan experts formed two working groups consisting of three fan projects each in order to share their expertise and methodology in several networking and study visits until June 2013. Furthermore, the fan workers set a timeline for the development of certain standards and the establishment of professional and socio-preventive fan work in Europe. This catalogue of criteria including the knowledge to be gained at the study visits of the two working groups will be presented at the European seminar in Vienna in 2013. The meeting was organised in the framework of the EU-project „pro supporters – prevention through empowerment“ that is lead and coordinated by FairPlay and supported by the European Commission in the field of prevention of and fight against violence and intolerance in sport. “We had an interesting look at the work of the Kibice Razem Wroclaw and inside the fan-scene of WKS. Our impression is that the fan project has very good prerequisites to work successfully in the next years. A nice “Fan House”-location in the city-centre and employees with a high motivation and very good knowledge about the scene and the club. There seemed to be good cooperation with the club management and the safety and security authorities.When the colleagues from Hannover needed help, you could directly talk to the security-manager and gave Hannover the information they needed. The cooperation with the supporters association and the disabled supporters makes sense. The long-standing and experienced fan project Jena supports and assists the younger fan projects from Wroclaw and Salzburg in several study visits. The study visits are organised in the framework of the EU-project „pro supporters – prevention through empowerment“ that is lead and coordinated by FairPlay and supported by the European Commission in the field of prevention of and fight against violence and intolerance in sport. In the framework of the EU-project pro supporters, coordinated by FairPlay-VIDC, the working group of the Innsbruck, Liberec and Bremen fan projects met in the Hanseatic city to learn about the working methods and the concept of the Fanprojekt Bremen from 18 to 20 January 2013. The Fanprojekt Bremen was founded in 1981 and thus is the oldest professional fan project in Germany. Now the “younger” fan work projects from Liberec and Innsbruck can take advantage of the 30 years of experience of the fan project in Bremen. In the framework of this study visit, the fan experts reflected and discussed the work content and regional differences and also worked out the first criteria for a catalogue for the implementation of professional fan work in Europe. Furthermore, the guests had the opportunity to assist the work of their colleagues around the Bundesliga match SV Werder Bremen against Borussia Dortmund. Two social scientists from the universities of Loughborough and Durham who evaluate the project participated in the meeting, too. Interestingly, the Fanprojekt Bremen and Fanarbeit Innsbruck have the same structures: both projects are organised in an independent and grass-root orientated way. Moreover, both fan projects have a support organisation (Bremer Fanprojekte e.V. and Faninitiative Innsbruck) with a board formed by experts in the field of social work and active fans. This organisational structure seems to be one key for a successful implementation of professional fan work. Another network meeting in the framework of the project "pro supporters - Connecting Fan Projects" took place in Jena, where the working group Wroclaw, Salzburg and Jena met. During the Regionalliga season opener between FC Carl Zeiss and the FSV Zwickau on March 22nd 2013 the revealing insight into the work of the fan project Jena was offered to guests from Poland, Austria and England. Parts of the 2-day program of the study visit were a presentation of football in Jena with focus on the structures and activities of the fan scene and especially the work of the fan project. There was a lot of time for a lively exchange and the participants could benefit from the years of experience and successful work of the fan project Jena. 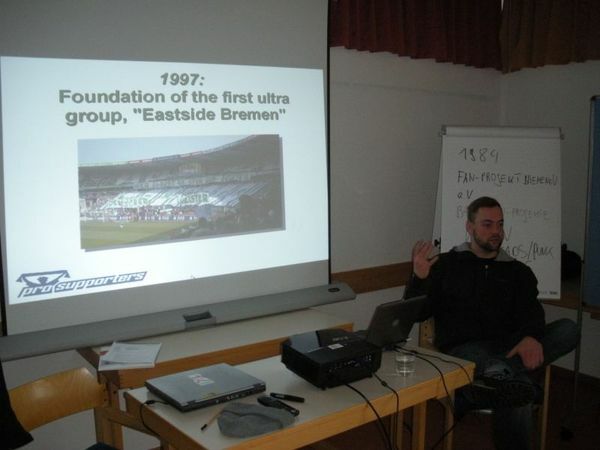 Besides the formal exchange and the extension of the resulting criteria catalogue for the establishment of social preventive work with fans in Europe the guests had the opportunity to get to know the concrete work on a match day and to gain a better insight into the organization and structure of the fan work in Jena. Due to the good integration with all involved entities such as club, police and fan scene, the cast with nearly three full-time positions and the extraordinary commitment of volunteers, the work can certainly be considered as exemplary and provided insightful knowledge for all participants. The interesting part program which included a visit to the exhibition "A love in the east. 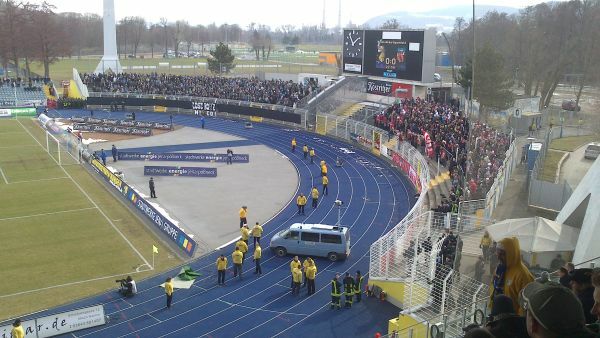 Football in Jena. " and contacts with the Ultras of Südkurve Jena rounded off a perfectly organized and interesting weekend. At this point, once again, many thanks to the fan project Jena for the educational stay and the hospitality. In addition to the continuous exchange of the second working group Bremen-Liberec-Innsbruck and the visit at Tyrol, there are following meetinging in Wroclaw and Salzburg. The findings of the work of the pro supporters project, which will be presented to the public as part of a European seminar in Vienna, are a basis for the further work of the coordination offfice of fan work in Austria, which will continue to work on the construction and establishment of social preventive work with football fans in Austria . The study visits are part of the EU project "pro supporters - Prevention through empowerment", which is coordinatet by FairPlay and supported by the European Commission in the area of violence prevention and fight against intolerance in sport. During the European project "pro supporters - connecting fan projects", Fanarbeit Innsbruck (Fan Work Innsbruck) and FC Wacker Innsbruck welcomed international fan experts from England, Germany and the Czech Republic during the last home match against Rapid Vienna. For this transnational project which is coordinated by the Austrian organisation "Fair Play. Different colors. One game." all three fan work locations of the working group Bremen, Liberec and Innsbruck are hosts. The aim is to evaluate the work and to develop an international criteria catalogue for the implementation and establishment of professional work with fans. During their stay in Innsbruck the experts underlined the fact that fan work with only one full-time social worker is a big problem. 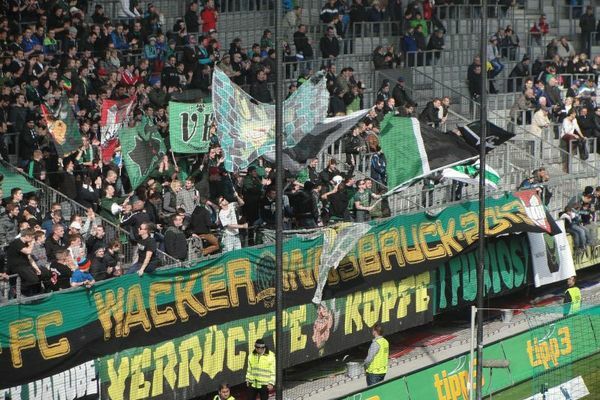 But all participants agreed that there is good cooperation between fans, FC Wacker Innsbruck, the stadium security and Fanarbeit in Innsbruck which unfortunately is not the standard in many cities. In this context the fan workers also stressed that the relationship with the Wacker fans is very positive due to this common work. In this working group of the EU project there are the oldest German fan project from Bremen (founded in 1981) and the two "young" projects from Liberec (CZE) and Innsbruck. During the first study visit in January this year, the participants visited the fan project in Bremen and got to know their long story of successful work with football fans. With the participation in this project especially Fanarbeit Innsbruck is eager to get an additional impulse to assure and enhance the quality of their work. In this context Armin Weber, the head of the fan work in Innsruck said: "For Innsbruck and Austria this EU project is a great opportunity in the development and establishment of professional work with fans. I want to thank for the visit and especially for the constructive feedback to work with fans in Innsbruck. " To complete the project "pro supporters - connecting fan projects" there will be a study visit in Liberec (3-5 May) and a European Seminar in Vienna (3-4 June) where the results and the criteria catalogue will be presented to the public. The study visit was organised in the framework of the EU-project „pro supporters – prevention through empowerment“ that is lead and coordinated by FairPlay and supported by the European Commission in the field of prevention of and fight against violence and intolerance in sport.